All Amish swings are set apart because our they are made with pressure-treated wood encased in strong, durable vinyl. Vinyl is virtually maintenance free (no splintering! ), with a crisp, color coordinated look that will remain attractive for years. 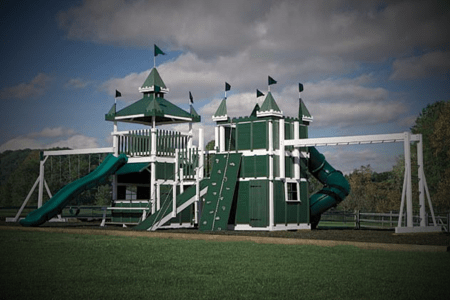 Not only are our swing sets of the highest quality, making them durable year-round, we also make sure your children will be safe when playing on any one of our swing sets. There is no risk of splinters and small fingers won’t be easily pinched on chains (they’re all covered!). Additionally, all of our play decks are extra-large with strong railings, so there is plenty of room for everyone without the risk of a fall.